Five hundred years ago Tripura was called “Shriibhum”. The name “Tripura” is not very old. Present day Tripura, Noakhali, Hilly Tripura, Kachar, Manipur, Chittagong, Chittagong Hill Tracts and a part of the Arakan kingdom constituted the land of Shriibhum. In old records Shriibhum was called “Upabanga”. Upa means “nearer” and Banga means “Bengal”. The original inhabitants of Upabanga were all Bengalees, except for a group of tribals called “Tipprah” who lived in one small region. About 550 years ago, these Tipprah tribals came from northern Burma under the leadership of Mu-Chang-Fa and settled in Tripura permanently. Later, they defeated the Hindu king in the area and established the kingdom of Tripura. Since that time, the part of Shriibhum under Mu-Chang-Fa was called “Tripura”, as it was the land under Tipprah administration. Around the same time a movement for cultural synthesis under the leadership of Caetańya Mahaprabhu was going on in Bengal. Caetańya went to Tripura to preach his Vaeśńava philosophy. Mu-Chang-Fa and the members of his royal family were very impressed with Caetańya’s ideas and the rich Bengali language he spoke, so they took initiation from him. The king also embraced Bengali culture as his own culture. After that all the members of the royal family took Bengali names instead of tribal ones and adopted Bengali instead of their tribal language as the family and court language. From that time up to the last days of British rule in India, Bengali was the official language of Tripura, and Bengali culture was the culture of the region. The Tripura tribals have their own dialect called the “Kak-Barak” dialect, which is of Burmese origin. However, this dialect does not have all the characteristics of a complete language. After independence Bengali was replaced by Hindi or English. Under the regime of the Left Front government, the communist leaders, in an effort to materialize their separatist designs, recognized the Kak-Barak dialect as the official state language. They imposed this dialect, which is spoken by 700,000 tribals, on the 1,750,000 Bengali people in the state. Thus, the communists dealt a severe blow to the cultural synthesis which had been taking place between the original Bengalees and the tribals in Tripura for the previous several hundred years. 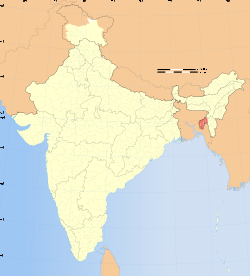 During the ancient Hindu, Buddhist, Pathan and Mughal periods, and even in the British period, Tripura was economically self-sufficient, but Tripura’s economy received a severe set back with the partition of Bengal in 1947. According to the decision of the Radcliffe Commission, the part of Tripura rich in agricultural potentialities was included in East Pakistan, and the other part, consisting of hills, forests and jungles, was given to the Indian Union. Thus, in the constitutional structure of the Indian Union, the hilly, undeveloped areas took the shape of the economically shattered state of present-day Tripura. Since independence, Tripura has fallen prey to negligence, deprivation and exploitation. In the interests of Indian capitalism, Tripura has been kept at the mercy of the central government, and has barely been able to maintain its existence. Now the abject poverty of the 2,450,000 people of Tripura has become a weapon in the hands of the political parties in the state, who try to use it for their own political gain. Severe economic insecurity and an atmosphere of political violence have been deliberately encouraged in Tripura to check the awakening political consciousness of the people. Tripura has been forced to pass through many traumatic and violent events because of the manipulation of political leaders. In addition, nearly seventy percent of Tripura’s land has been distributed among the 700,000 tribals through the Autonomous District Council Act, depriving many of the 1,750,000 Bengali people of land. The present situation in the state is the result of a far-reaching anti-Bengali campaign by the central government and an anti-national, separatist conspiracy by the communists in Tripura. Despite Tripura’s current economic and political instability, the region has a very bright future because it is rich in natural resources. The topography of Tripura is shaped like a saucer – the outer border area is more elevated than the inner central portion. In this respect it resembles Ireland. The main differences between the two are that the hills and subterranean rock structure of Tripura are composed of granite, so Tripura is more rocky, but Ireland is colder. Although Ireland is not very developed, it can serve as a useful model while preparing socio-economic developmental programmes for Tripura. In ancient times, large forests inhabited by elephants and rhinoceroses grew in the inner part of Tripura, and the provincial towns and agricultural areas were located around the borders of the outer rim. The soil in the inner portion is very suitable for growing cashew nuts, pineapples and bananas. Generally, the soil covering the granite rocks throughout Tripura is sticky soil which is ideal for agriculture, and especially for growing oranges. The border area touching Bangladesh is a rain-shadow area. There is tremendous agricultural potentiality in Tripura. However, due to the granite bedrock, the aman variety of paddy will not grow well; the áus variety grows better. Áus paddy may be followed by chilli cultivation. Chilli is a good cash crop because it is in great demand in Bangladesh. When the land is still wet after harvesting the áus paddy, dry chillies can be sown. Dry chillies need to be watered like wheat. Where there is a scarcity of water, small gram can also be grown. Huge quantities of red skinned potatoes can be grown as in Ireland, where the people eat a lot of potatoes and porridge. Tripura can grow enough potatoes to feed the whole of Assam, and the powered potato industry can flourish. On the higher land potatoes, pineapples, and cashew nuts can be grown, while bananas can be grown on the lower land. Ginger of all varieties – white, yellow and black – can also be grown. Large quantities of arum can also be grown, but arum takes nearly one year to mature. You should also know the types and locations of the mixed crops. Tripura can grow the second best bamboo in the world after Mizoram, hence paper mills can be started. Hollow bamboo (phánpá bansh) is the best type for paper production. More sugar beet than sugar cane should be cultivated, because four sugar beet crops a year can be grown in Tripura instead of just one sugar cane crop. Sugar beet can produce sugar but not gúr, and it is a good cash crop. Gúr can be produced from sugar cane and the waste can be used to manufacture good quality paper. The seeds of sugar beet should be grown in cold climates, and the best places are Himachal Pradesh and Kashmir. However, it is best to produce seeds in one’s own land. Both agro-industries and agrico-industries can be started. Alcohol, pharmaceuticals, medicinal plants and silk can all be produced in Tripura, and inferior quality coal is available. Once upon a time Tripura was part of a sargasso sea, so there is also scope for producing oil. You should have a blended knowledge of the soil condition, the river systems, irrigation, the power and energy supply, the mineral resources, the culture of the people, and the agricultural, horticultural and industrial possibilities. The future of Tripura is very bright if socio-economic planning is done in a proper way.